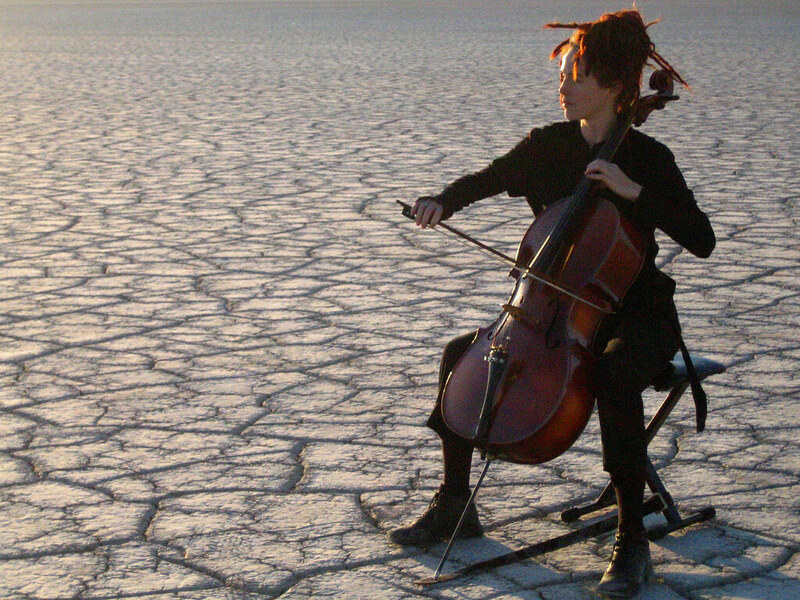 She calls herself an avant-cellist. I view her as an experimental control freak. She plays in an orchestra-of-self, one of numerous artists who use loops and multiple tracks to build up layers and layers of their own sound until they have the whole background band against which to play. Zoë does that too, but it’s a second-order effect. So that despite the fact that I’ve watched her on video, and now in person, there are times where things are happening in the music where I just can’t follow the combination of construction and music and it seems to swirl away from me, only to converge a little later in a passage that raises goosebumps. I don’t know why I react to her music as I do. Some of it is just because I like the music. I don’t like the answer but suspect there’s some synaesthetic component that makes me respond to parts that are at least as much structural as musical. She pointed out this thing about Beethoven’s 7th Symphony, and then proceeded to play it. In that if you loop the cello part on itself without any other tricks, it plays out against itself into an almost elaborate canon or fugue. Of course, I’m into classical music without knowing so much about names and things so I know I know the 7th, but had no idea which it was till she played and the light-bulb went off in my head and I could hear the violins in my head playing against the cellos on the stage. Like she said, there’s 16 of her. But I think she miscounts that, forgetting the extra Zoë that’s live. Still, I need to get my hands on the score. Because I am not a music scholar but I know that Beethoven and his ilk were prone to this kind of construction, and now I want to read it, just to feel the technical detail of the beautiful sound. I want to touch the atoms of the song. We stood for 3 hours. And almost two of them were just waiting for things to start. There were no chairs which is odd in a musical performance in a hall, but I guess maybe it’s cheaper that way. And when she came onto the stage, she apologized for the delay that had resulted from her getting her hair caught on a hanger. Which is kind of funny. And entirely credible given the fact that she’s tall and long with her red dreadlocks up in a strange sort of spike. Long and thin. Her arms seem like they’d be thinner than my fingers. But she moves. My violin teacher taught me to notice that, back when I was 14, and it has gradually become a measure, to me, of musicianship. The people who know how to play, who really play, they can’t not move to the music. The performance isn’t just the instrument, or else the instrument isn’t just the machine, but it’s the combination of the two, and the sound would not be the sound unless the sound came with the sway or the lean. Pizzicato requires the head-bob. And the long draw of the bow is pulled by the chin. How do I forget how much I want a cello? I posted this elsewhere and I was asked what my favourite song of hers is, or what I’d recommend. Right now, I’ve rediscovered “Escape Artist” from her latest album. More info at ZoeKeating.com. And if I’ve pointed you to something new, let me know. She’s a fun artist to share. Listening now. Thank you for the link.